A Bonnie-and-Clyde type have just robbed a bank. Charissa Nolan is on their trail. Students tackle network forensics Wednesday at the official opening of the Arizona Cyber Warfare Range – Metro Phoenix, located at 27th Avenue and Camelback. From behind a keyboard and the blue-tinged glow of a computer screen, she clicks a computer mouse here and tap-tap-taps on a keyboard there, hacking into the couple’s encrypted emails. Soon, she has unraveled those encrypted emails – the telltale signs of a bank robbery plan being put into motion. Bank robbers caught in the act – well, virtually, at least. It was just one of the scenarios cybersecurity aficionados tackled Wednesday morning at the grand opening of the Arizona Cyber Warfare Range – Metro Phoenix, a 4,500-square-foot facility at Grand Canyon University that’s the first jewel in the crown of what will become a 140,000 square-foot innovation center but also is a reflection of the campus’ focus on becoming a leader in science, technology, engineering and math. Nolan loved the adrenaline rush and still has her eye on becoming a cyberwarrior. Mueller stressed the number of cyberattacks and the number of unfilled jobs in cybersecurity. It’s a thought shared by Jeanne Barconey, an applied business and information systems major who is thinking of going into cybersecurity. When it comes to hacker-stopping, that’s what the new cyber warfare range is dedicated to helping people do as a free, hands-on, real-time, real-world cybersecurity training center. It’s where anyone can drop by – the range is open to the community, not just GCU students – to learn everything from password cracking to keycard cloning and breaking into networks. 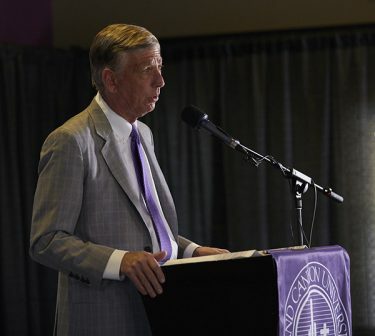 GCU President Brian Mueller, addressing a crowd of more than 100 media, community and industry leaders, expressed how important cybersecurity has become – and how vital a facility such as the cyber warfare range is. Cybercrimes worldwide, he said, are expected to cost $6 trillion by 2021, cyberattacks take place every 39 seconds, 4 million records are stolen by cybercriminals every day, and 50 percent of cyberattacks occur against small businesses that lead to permanent closure within six months, according to 2017 statistics from Cybersecurity Ventures. “The cost of this is obviously HUGE,” Mueller said. John Iannerelli, a retired FBI agent, said “we cannot afford to lose” the cyber war. Featured open house speaker John Iannarelli, a retired FBI special agent in the cyber division, detailed that cost on a global scale. The FBI, he said, “is sadly lacking” when it comes to cybersecurity and that we need collaborative efforts, such as the cyber warfare range, to win the battle. Unfortunately, Mueller added, not enough people are trained in cybersecurity to fill all the job openings. More than 300,000 jobs are open in the cybersecurity industry in the country with 7,200 of those job openings in Arizona, based on numbers from Cyberseek. “We’re one of the only universities in the country to have a master’s degree program in cybersecurity,” Mueller said. Dr. Heather Monthie, Assistant Dean of GCU’s College of Science, Engineering and Technology, said the master’s program teaches the University’s “cyberLopes” not just hands-on skills, but management skills, and legal and ethical issues under a “hackers with halos” concept. Mueller added that it’s not possible to bring everybody who needs to be trained to fill all those job openings to a physical location such as GCU or the cyber warfare range. Frank Grimmelmann, President and CEO of the Arizona Cyber Threat Response Alliance, said the key is finding people who have cybersecurity skills. “This is going to have to be done through innovative practices. … It’s going to have to be done online,” he said. GCU is itself an innovator in online learning, touting more than 70,000 online students. 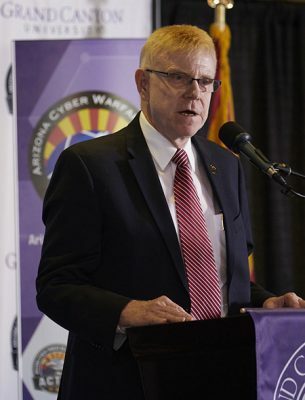 Frank Grimmelmann, President and CEO of the Arizona Cyber Threat Response Alliance, said the cyber warfare range is part of the solution to those cyberthreats. For one, it’s a way to find people who have cybersecurity skills. The unique thing about the range, he said, is that it offers a “real-world environment” with hands-on learning. Scott McCrea, GCU College of Science, Engineering and Technology faculty member, echoed that sentiment. 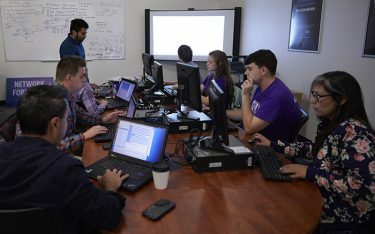 While anyone can learn via textbook and virtually, “This is a live-fire range our students are looking at with live-fire engagements,” he said, meaning anyone in the community can go in and actually break a password code or hack into a system – for the purpose, of course, of learning what cyber bad guys do and to better know how to defeat them. People with calluses and dirt on their hands, McCrea said, will be better prepared than the theorists. 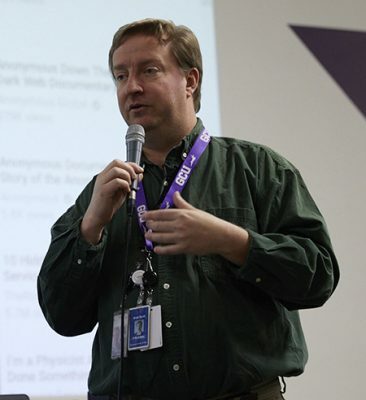 Brett Scott co-founded the Arizona Cyber Warfare Range in the East Valley. The Metro Phoenix range on the GCU campus, at 27th Street and Camelback, is the range’s second location. One of the range’s primary missions is education: “We want to teach you how to attack. How on earth do you defend something if you don’t know how to attack?” Scott said, adding that other cybersecurity training programs don’t allow you to do some of the hacking activities that go on at the range. Another of the facility’s missions is in intelligence and battling other countries that are trying to attack the United States. 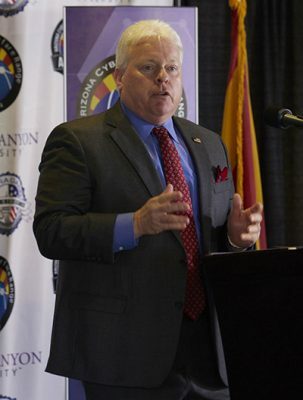 The Arizona Cyber Warfare Range – Metro Phoenix is open to the public at no cost. Its hours are 5 a.m. to 1 a.m. Monday through Saturday, though visitors are asked to check the range’s calendar online (at www.azcwr.org) beforehand to make sure volunteers are present. For more information on the range, call 623-300-2002.